RAPID CITY, S.D. 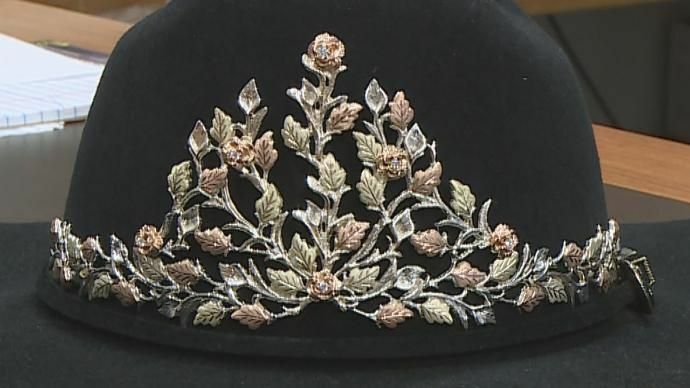 – The crown for Miss Black Hills Stock Show has gone through a number of transformations; each is as beautiful as the previous one while incorporating a new style or design that marks a particular passage of the event. For the 30th anniversary this year, there is once again a new tiara, crafted of Black Hills gold and silver and bejeweled as befitting the crown worn by a reigning rodeo queen. Creating the new piece is Gold Diggers-Black Hills Gold of Rapid City, SD. General Manager Lucas Wheeler was excited to be a part of the newly designed commemorative piece that will travel the country with the newly crowned queen as she travels to rodeos, presentations, workshops and ultimately to the 2019/2020 Miss Rodeo USA competition, over the next year. Former Miss Rodeo USA's from five-state ranch country include Trisha Smeenk, South Dakota, 2012; Stacy Jo Johnson, Wyoming, 2006; and Amy Hettich, Wyoming, 1995. The most recent Miss Black Hills Stock Show crown sponsored by Neugebauers will be retired as the Gold Digger crown is unveiled and presented.